News, comments from contributors, discoveries from the archives, plus items of curiosity. Whether you are an academic, an admirer or inquirer, please send notes or questions to the contact e-mail address below. Compiled by: Nick Birch. Marie Corelli website administrator, Stratford-upon-Avon. We were recently contacted by someone who thought they had some items of Marie Corelli’s furniture. Her mother is believed to have bought them at the auction of the contents of Mason Croft in October of 1943, following the death of Bertha Vyver. 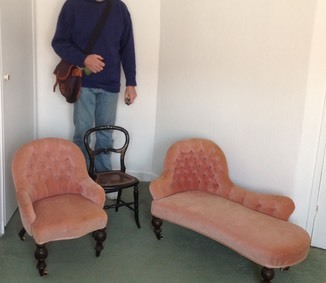 The three items are; a cane back chair, an upholstered tub chair and matching chaise long. The unusual thing is that all three are very small - see the picture with someone in it for scale. Although the chair & chaise long have been recovered, the original fabric, which is white and covered with flowers, was kept. In Teresa Ransom’s biography on Marie Corelli, p217, it says that the Tower was apparently furnished with items of small furniture that Marie had had as a child, explaining their diminutive size. If you are interested in acquiring any of these unusual pieces, they may be for sale. The owner would like them to go to someone with a real interest in their history. Please contact Hattie Gauld at hattiegauld@live.co.uk. The items are near Stratford-upon-Avon. 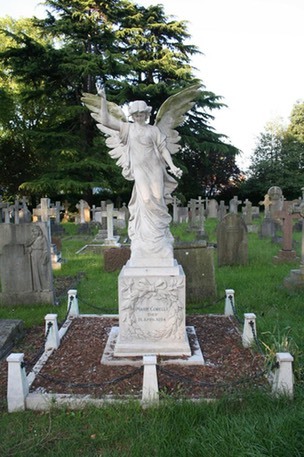 We are delighted to announce that a project to restore the angel that stood over Marie Corelli’s grave in Stratford-upon-Avon is now well under way. 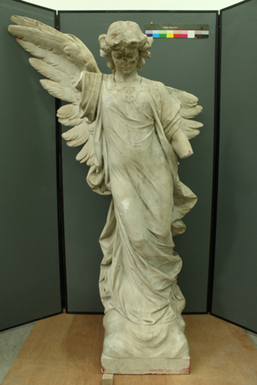 The statue was moved to the City and Guild School of Art in London in September where their Conservation Department, led by Dr Marina Sokhan, is beginning a process of conservation and restoration of the marble statue, shown here before work began. The significant damage to the statue caused when it was toppled is a follows; a broken right wing, the right arm is broken into nine pieces with fragments of two fingers missing, and the left arm is broken into three pieces. The work is being undertaken by one of the Conservation Department’s final year students who will complete the work over the forthcoming academic year. The intention is to return the statue for reinstatement in late June or early July. 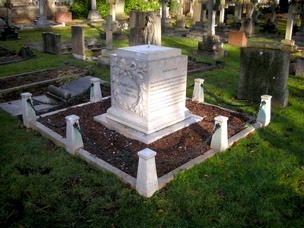 In the meantime the grave will be cleaned and re-furbished by Stratford's monumental masons, GEO Clifford. 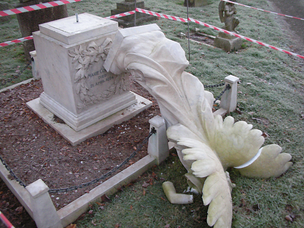 The project was instigated by Nick Birch, (administrator of this website), and adopted by Stratford Society, who organised minor repairs to the statue back in 1996. Funding has come from a Stratford Town Trust grant, with contributions from Avon~Boating Ltd, who own Marie Corelli’s gondola, and from private donations.